On the morning of the 25th of July 2011 I observed Cambridge magistrates deal with a Ms Waresha who had pleaded guilty to careless driving following a collision with a cyclist in Cambridge. 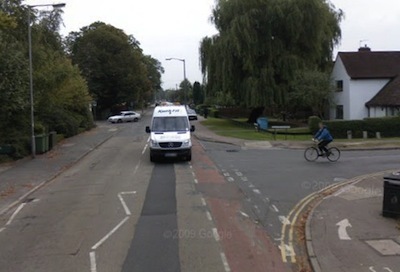 The prosecution said that on the 25th of January Ms Waresha was driving a red Vauxhall Corsa along Cherry Hinton Road in Cambridge, she then turned right into Wulfstan Way and while doing so crossed the path of a cyclist coming in the other direction colliding with them, causing injury and damage. Ms Waresha was not present in court, she had decided to plead guilty by post. This meant that all the court was allowed to hear was the short summary of the offence from the prosecution and her response. Her response was that she was so sorry, hadn’t seen the cyclist, and that she had never had an accident before. The court was told by the clark that Ms Waresha had a Polish licence and enquiries with the DVLA had revealed that she was not known to them. The magistrates deliberated in court. The chairman said: “She cut across him”, and asked the clark about the extent of the cyclist’s injuries. The clerk explained that as Ms Waresha was pleading guilty in her absence there were strict rules limiting what the court could be told; it could only be told the details of the prosecution’s case as it was written, as it had been available to Ms Waresha to respond to. The clerk said she couldn’t say anything else and that the rules were in-place for good reason. The magistrates sentenced Ms Waresha to 6 points, a fine of £150 plus a victim surcharge of £15 and court costs of £70. The chairman of the bench then spoke to ask if the position was that it if you were charged with careless driving it would be best to plead guilty by post as then the magistrates wouldn’t get very much information on which to base their decisions. The clerk responded to tell the magistrates that they should rely on the police and crown prosecution service to have included anything relevant in the prosecution statement. She said “The prosecution should draft the statement to include all relevant information”, and explained that the statement could have been amended by the prosecution at anytime if further information had become available. I think that by mentioning the cyclist was injured, but not saying to what extent, the police and CPS have failed to provide the magistrates with all the information they needed. I thought it was poor that the magistrates did not decide to write to the CPS and the police to explain they felt they had not been given enough information and to ask them to do better in the future. It was notable that there was no statement from the cyclist, and no claim from the cyclist for the costs of the damage (presumably to their bike), I wonder if again this is because the police and prosecutors have not done a very good job. I was surprised that no investigations into if Ms Waresha was legally driving on her Polish licence were reported to have been carried out. The courts clearly contact the DVLA in relation to those with UK licences, why don’t they contact the Polish authorities? The magistrates did not make any statement about what the effect (or presumably lack of effect) of giving points to someone without a UK driving licence would be. Presumably they would like the DVLA to create a record for this individual in the UK and add the points to that, but that was not made explicit. As Ms Waresha did not attend court in person her address and date of birth were not publicly confirmed; so I am unable to identify her to the usual degree of precision. As far as I know as an immigrant from another EU country you have to hand in your foreign driving license within three years in exchange for a UK license. The British authorities don’t seem to bother with this at all. In this case the police should have checked for how lang Ms. Waresha has been resident in the UK and if she is infringing this rule. I’m not sure that the severity of injuries has much relevance to the seriousness of the offence. If the driver had cut across the cyclist and braked at them last moment they would still have been guilty of dwdcaa. However, the police are very reluctant to take action unless there have been consequences of bad driving. Any compensation due to the cyclist would be dealt with by civil courts, not magistrates. The courts regularly order compensation to victims of criminal offences. 1. The court must consider making a compensation order in any case where personal injury, loss or damage has resulted from the offence. It can either be a sentence in its own right or an ancillary order. The court must give reasons if it decides not to order compensation. The “must” in the above quote is due to the S.130(3) of the Powers of Criminal Courts (Sentencing) Act 2000 requires reasons to be given if compensation is not awarded. I suspect the bench I observed this morning breached the law, and the sentencing guidance, in this respect. until aged 70 or for three years after becoming resident, WHICHEVER IS THE LONGER PERIOD” (caps emphasis is mine).